Sly Fox keeps growing. I wrote a short article about it over here a few weeks ago. With growth comes new and exciting things. Independently over the past few years, Sly Fox has created an association between itself and the increasingly-popular outdoor game, Kan Jam. Pretty simple, right? Addictive for sure. Being the canned beer proponent that Sly Fox is, they've added an additional rule: all players must be holding a can in one hand while throwing/redirecting with the other. Of course, they can't force players to drink. But what fun would it be otherwise? 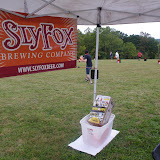 On Saturday, September 22, Sly Fox hosted the second annual (first at the new location in Pottstown) Can Jam Festival. There was very little about the second installment that resembled anything in last year's at their Phoenixville location — save for the discs, people throwing them, and the kans/cans. This year's was bigger, with more beer, food, and music to go around to the decidely larger audience and participants. My "usual teammate", William Reed and my reserve teammate, Nick Johnson were both predisposed with too much work to take time out for some fun 'n' games in Pottstown. Reed and I had taken a very respectable second place during the Philly Beer Week event at the Four Seasons Hotel back in June, so you can imagine the anticipation to take the competition to the next level in a field of 64 teams — yes, I said 64 teams — at Sly Fox's new home back in September. But, it wasn't meant to be so my first-time teammate became none other than brewery co-owner John Giannopoulos. Good thing my Washington Times review of their growing operations was well-received! Nonetheless, we turned in a quite a respectable performance, convincingly winning two consecutive matches but not after losing equally-convincingly in the first (turned out to be last year's runner-up team). Still, a 2-1 record in the first round was not enough to move on from the first round in the bracketology that ringleader/sales extraordinaire/bartender-to-the-??? Corey Reid masterminded. It was on to socializing and documenting for me. What a beautiful day it turned out to be for this event. The forecasted rain did not move until very late in the afternoon/early evening, so the outdoor games, music, food, and beer could be enjoyed without getting soaked. A little sunburn, on the other hand, was not avoided. The pictures should likely tell the story of the gold mine that Sly Fox is sitting on with their new property. Rough counts had the first-year crowd for this event at a modest 600, give or take. It was tough to tell as there was a constant circulation of guests in to, out of, and around the brewery property. But, still, there is plenty of room to grow with capacity for many hundreds more. Can Jam Festival 2013 seems like a near certainty. Could a move of the Goat Race/Bock Festival to Pottstown be far behind? There's some disagreement to that right now and no one will say for sure. But, judging the reaction of brewery personnel and guest alike, there is a lot of potential for future event planning at the new Sly Fox in Pottstown.